December 09, 2017, Huntington Ingalls Industries’ (HII) Ingalls Shipbuilding division christened the Legend-class National Security Cutter (NSC) USCGC Midgett (WMSL-757) in front of hundreds of guests. «We often speak of our service as a family, our Coast Guard family», said Admiral Charles Michel, vice commandant of the U.S. Coast Guard, who was the ceremony’s keynote speaker. «The Midgett name takes that seriously with a family legacy unprecedented in the armed services, a family that is all about service before self. Such a special name deserves to be emblazoned on a special platform. The Ingalls Shipbuilding team have built this incredible platform, something to be incredibly proud of and something the men and women of the United States Coast Guard take very proudly». «Midgett is the eighth ship we have built in this class», said Ingalls Shipbuilding President Brian Cuccias. «And with her, we’ve proven once again that American workers, Ingalls shipbuilders, can take on some of the most challenging manufacturing projects in the world. All Ingalls ships are built with one goal in mind: to protect the brave men and women who protect our freedom. Our Ingalls/Coast Guard team continues to get stronger and more efficient with every ship we produce. And Midgett will be no exception». Jazania O’Neal, Midgett’s granddaughter, is the ship’s sponsor. She christened the ship by breaking a bottle of sparkling wine across its bow, saying, «In the name of the United States of America, I christen thee Midgett. May God bless this ship and all who sail in her». Ingalls is the sole builder of Legend-class NSCs and has successfully delivered six to the Coast Guard. Midgett, the eighth ship in the class, was successfully launched in November. USCGC Kimball (WMSL-756) is scheduled to be delivered to the Coast Guard in 2018. Legend-class NSCs are the flagships of the U.S. Coast Guard. They are the most technologically advanced ships in the Coast Guard’s fleet, with capabilities for maritime homeland security, law enforcement and national security missions. NSCs are 418 feet/127 m long with a 54-foot/16 m beam and displace 4,500 long tons with a full load. They have a top speed of 28 knots/32 mph/52 km/h, a range of 12,000 NM/13,809 miles/22,224 km, an endurance of 60 days and a crew of 120. The Legend-class of cutters plays an important role in enhancing the Coast Guard’s operational readiness, capacity and effectiveness at a time when the demand for their services has never been greater. Huntington Ingalls Industries’ (HII) Ingalls Shipbuilding division launched the National Security Cutter (NSC) USCGC Midgett (WMSL-757) on Wednesday, November 22. Midgett is the eighth NSC Ingalls has built for the U.S. Coast Guard. It will be christened during a ceremony on December 9. 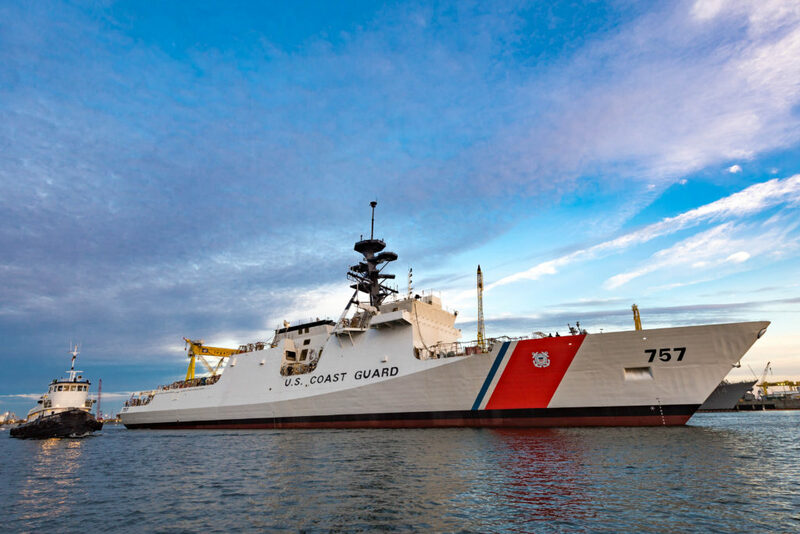 «As the National Security Cutter program continues to mature, we are providing our Coast Guard customer the best ships in their fleet», said Ingalls Shipbuilding President Brian Cuccias. «Our shipbuilders know and understand the importance of quality in building these highly capable cutters so the men and women of the Coast Guard can perform their important national security missions». USCGC Midgett (WMSL-757) was translated via Ingalls’ rail car system to the floating dry dock last week, and the dock was moved away from the pier on Tuesday night. With the assistance of tugboats, Midgett launched off the dock early Wednesday morning. «We’ve become very good at building these ships and continue to improve with the incorporation of lessons learned from previous cutters», said Derek Murphy, Ingalls’ NSC program manager. «Launch is a much-anticipated and exciting event, but it’s still just one step in bringing this cutter to life. Our shipbuilders are ready to get back to work to ensure Midgett is the best NSC to date». Legend-class NSCs are the flagships of the Coast Guard’s cutter fleet. Designed to replace the 378-foot/115-meter Hamilton-class high-endurance cutters that entered service in the 1960s, they are 418 feet/127 m long with a 54-foot/16-meter beam and displace 4,500 tons with a full load. They have a top speed of 28 knots/32 mph/52 km/h, a range of 12,000 NM/13,809 miles/22,224 km, an endurance of 60 days and a crew of 110. 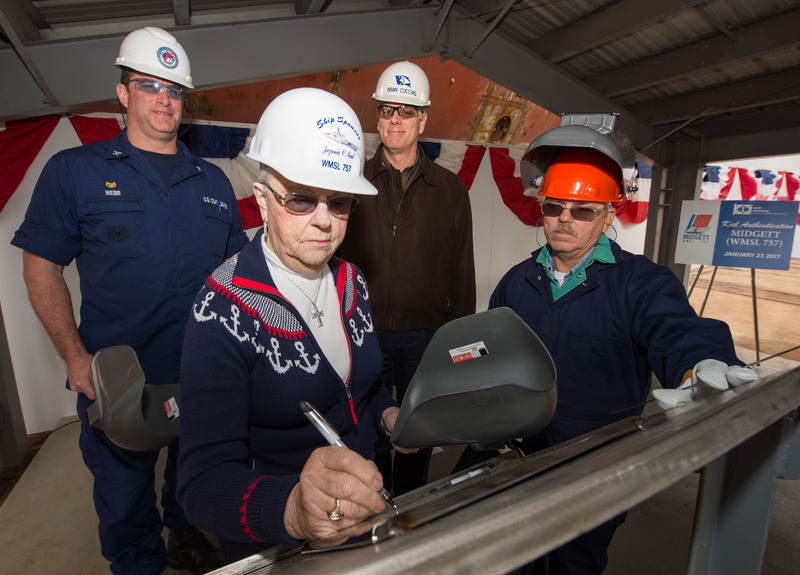 Huntington Ingalls Industries’ (HII) Ingalls Shipbuilding division authenticated the keel of the eighth U.S. Coast Guard National Security Cutter, USCGC Midgett (WMSL-757) on January 27, 2017. «The National Security Cutter Program is vital to our Coast Guard, our country and to Ingalls Shipbuilding», said Ingalls Shipbuilding President Brian Cuccias. «Today, we lay the foundation upon which this great ship will be built. The Midgett, like her sister ships, is being built to the highest quality standards with outstanding cost and schedule performance, and the NSC team is energized to make this one the best yet». 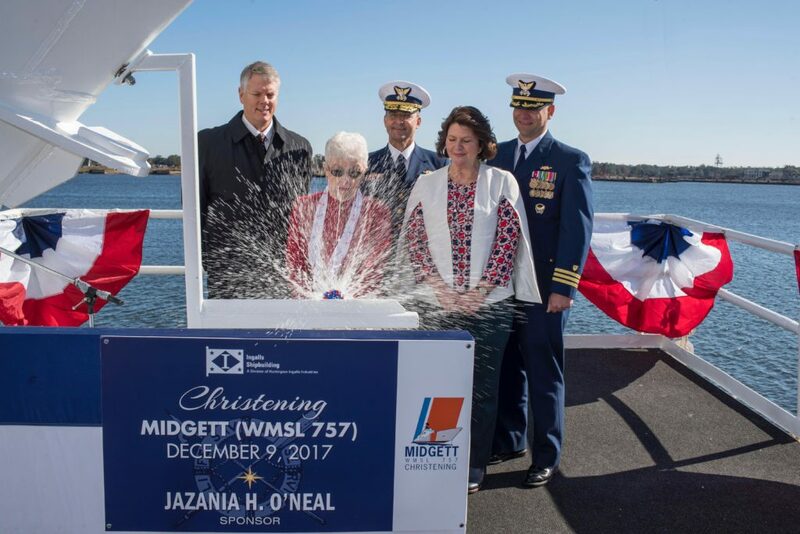 Jazania O’Neal, Midgett’s granddaughter and the ship’s sponsor, spoke today, proclaiming Midgett’s keel to be «truly and fairly laid». O’Neal’s initials were welded onto a keel plate by Jack Beard, a structural welder at Ingalls. «For my grandfather to be memorialized as the namesake for this ship, in the company of the seven other Legend-class ship namesakes, surpasses validation of our heritage on a worldwide scale», O’Neal said. «We wish you well throughout the remaining construction of this fine ship, and we look forward to seeing you at the christening». Ingalls has delivered six NSCs to the U.S. Coast Guard, and two more are currently under construction. In addition to USCGC Midgett (WMSL-757), the seventh NSC, USCGC Kimball (WMSL-756), is scheduled to deliver in 2018. In December 2016, Ingalls received a $486 million fixed-price incentive contract from the U.S. Coast Guard to build a ninth National Security Cutter – USCGC Stone (WMSL-758). 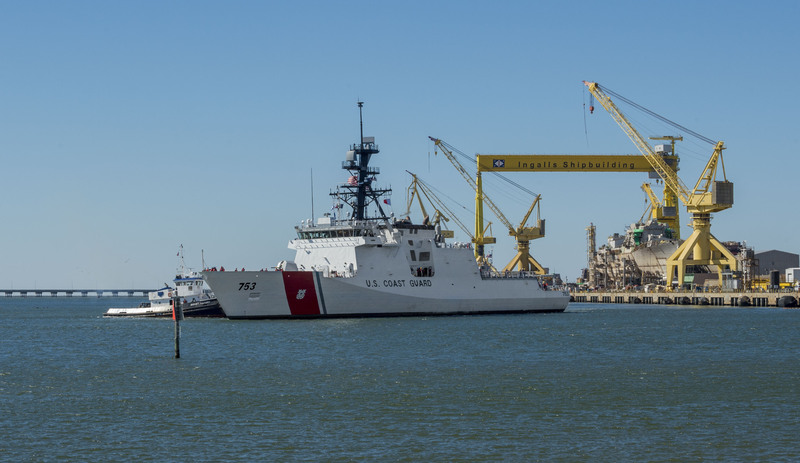 «The entire Coast Guard team is appreciative of the Ingalls Shipbuilding team», said Captain Christopher Webb, commanding officer, U.S. Coast Guard Project Resident Office Gulf Coast. «We rely on your talents, skills and masterful crafts to provide the NSCs we utilize to complete our many missions around the world. NSC 8 reached its start fabrication milestone just over 14 and a half months ago, and remains ahead of production schedule. Most importantly, I look forward to seeing the continued emphasis on quality, while maximizing NSC completeness improvements indicative of the planning, hard work, integration and shipbuilding excellence here». Legend-Class National Security Cutters are the flagships of the U.S. Coast Guard. They are the most technologically advanced ships in the Coast Guard’s fleet, with capabilities for maritime homeland security, law enforcement and national security missions. NSCs are 418 feet/127 m long with a 54-foot/16-meter beam and displace 4,500 tons with a full load. They have a top speed of 28 knots/32 mph/52 km/h, a range of 12,000 nautical miles/13,809 miles/22,224 km, an endurance of 60 days and a crew of 120. The Legend class of cutters plays an important role in enhancing the Coast Guard’s operational readiness, capacity and effectiveness. 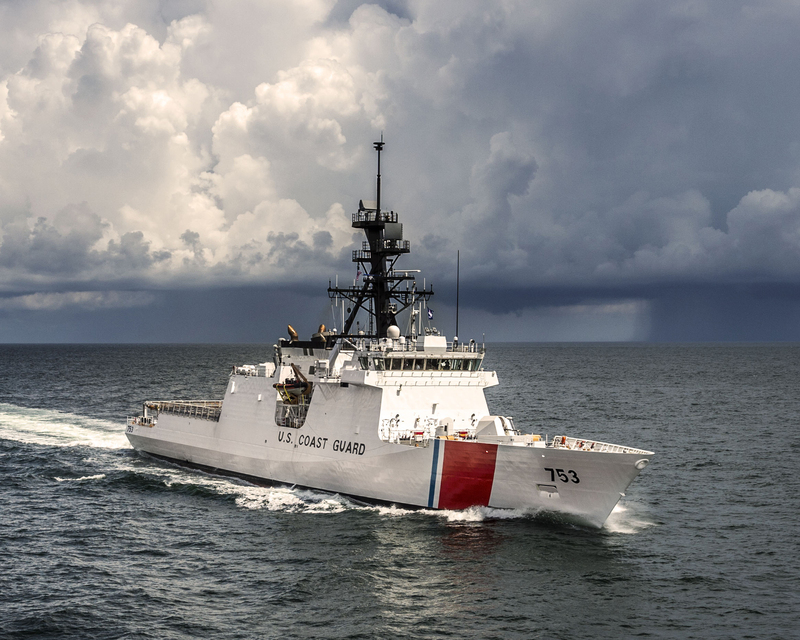 Huntington Ingalls Industries’ (HII) Ingalls Shipbuilding division has received a $499.8 million fixed-price incentive contract from the U.S. Coast Guard to build an eighth National Security Cutter, USCGC Midgett (WMSL-757). «We are performing extremely well in this program, proving the point that serial production is the most efficient and effective way to build complex military ships», said Jim French, Ingalls’ National Security Cutter program manager. «We continue to fold in learning for each ship we build, and the three under construction right now are tracking well because of this knowledge». 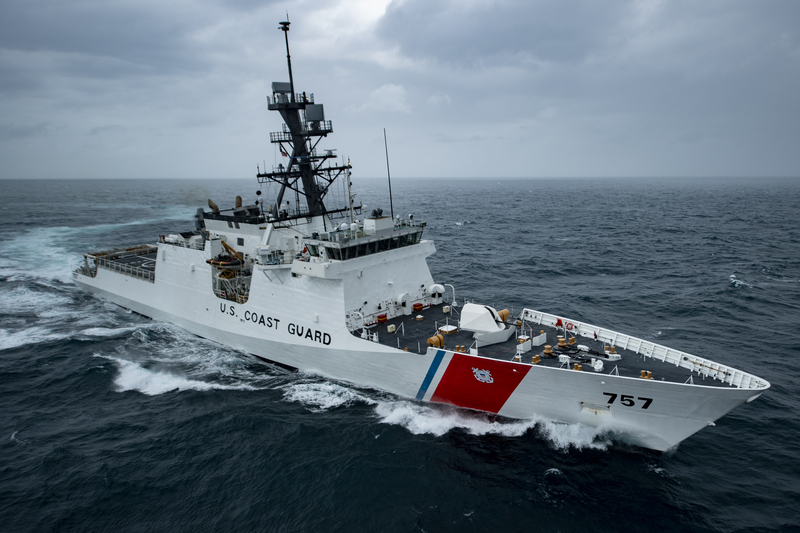 Ingalls has delivered four National Security Cutters to the Coast Guard and currently has three more under construction: USCGC James (WMSL-754), USCGC Munro (WMSL-755) and USCGC Kimball (WMSL-756). These ships will be delivered in 2015, 2016 and 2018, respectively. Midgett is scheduled to deliver in 2019. National Security Cutters (NSCs), the flagships of the Coast Guard’s cutter fleet, are designed to replace the 378-foot/115-m Hamilton-class high-endurance cutters, which entered service during the 1960s. NSCs are 418 feet/127 m long with a 54-foot/16-m beam and displace 4,500 long tons with a full load. They have a top speed of 28 knots/32 mph/52 km/h, a range of 12,000 nautical miles/22,224 km, an endurance of 60 days and a crew of 120. The Legend-class NSC is capable of meeting all maritime security mission needs required of the high-endurance cutter. The cutter includes an aft launch and recovery area for two Rigid Hull Inflatable Boats (RHIBs) and a flight deck to accommodate a range of manned and unmanned rotary-wing aircraft. It is the largest and most technologically advanced class of cutter in the Coast Guard, with robust capabilities for maritime homeland security, law enforcement, marine safety, environmental protection and national defense missions. The Legend-class of cutters plays an important role in enhancing the Coast Guard’s operational readiness, capacity and effectiveness at a time when the demand for their services has never been greater.